Simplify costly processes, reduce manpower budgets and reverse your losses in productivity and time - our practical cloud-based ERP solutions deliver proven results. Minimize the manual labour with IT solutions that make work easier and more efficient. Collaborate and keep track of work agendas better. Streamline workflows for the benefit of everyone. – See how our products support your business in every aspect. Enterprise One provides an integrated platform where you can streamline and automate core business processes from sales to marketing, inventory, procurement, service and support. Monitor and manage project timelines and statuses within the team. Automated and simplified sales, service and approval workflow saves time. Higher accuracy and more efficient project management. Create new leads from past sales data and analyse sales performance. Create relevant marketing strategies to target the right customers and find ways to improve customer experience. Improve service and increase conversion rates by identifying past buying behaviours. Track warehouse movement and product inventory sales in real-time. Avoid stock-outs and overstocks by planning re-orders according to demand from past sales data. Make smarter sales decisions from inventory data analytics. Streamline invoice processing while reducing headcount. Enable staff to focus on higher-value responsibilities instead of manual paper-based invoicing. Generate, email and print invoices quickly for faster processing times. Make early payment vendor discounts attainable. Easily track past invoices created. Eliminate formatting errors and greatly improve accuracy. Easily manage, control and oversee the entire purchasing process right from the procurement stage. Maintain accuracy and compliance with additional room for cost savings. Focus on your product sales strategy instead of the buying process. Keep track of sourcing and procurement materials. Optimize and standardize purchasing SOPs. Reduce processing errors and manual work. Gain greater visibility and understanding into the sales pipeline. Optimize, execute and monitor strategies or sales plans. Analyse performance in real-time. Manage sales targets, open up new opportunities and effectively utilize ways to influence and speed up buying. Introduce relevant contacts and sales strategies to influence the buying process. Create better proposals and ideas, analyse sales opportunities and resolve problems. Focus less on the technical details when selling and more on growing your business and increasing market share. Commerce Cloud contains all the tools you need for economic, flexible and scalable selling while delivering a seamless customer experience. Customize and personalize your site layout and design without technical knowledge. Focus on brand differentiation with easy-to-navigate commerce. Integrate and control sales, services, order fulfilment, shipping, tax payment and inventory management all in one platform. Efficiently make changes from a simplified storefront. Speed up and streamline management of HR processes like employee leave, performance, payroll and recruitment. Scalable, convenient and flexible payroll management on the cloud. Monitor and improve staff performance consistency. Easily implement compliancy with changing HR regulations. Centralized data and multi-user platform enables ease of access. User-friendly interface allows employees to self-track their leave status and file claims for greater convenience and HR time savings. Give customers more reasons to return. Track work and warranty statuses, work orders, last repair dates and replaced parts; and view vehicle details, next service action and cost estimates all in one place. Accurately keep track of your spare parts inventory and monitor for low stock availability with automatic stock level updates. Generate reports from workshop operations and management to evaluate overall performance and pinpoint areas of improvement. Speed up accident and insurance claim process with less time spent on document preparation and easier tracking of status with insurance parties. Monitor previous maintenance services done to allow routine follow ups on the next servicing due date and maintain service continuity. Track previous repairs done per vehicle to enable fast and efficient service enquiries. 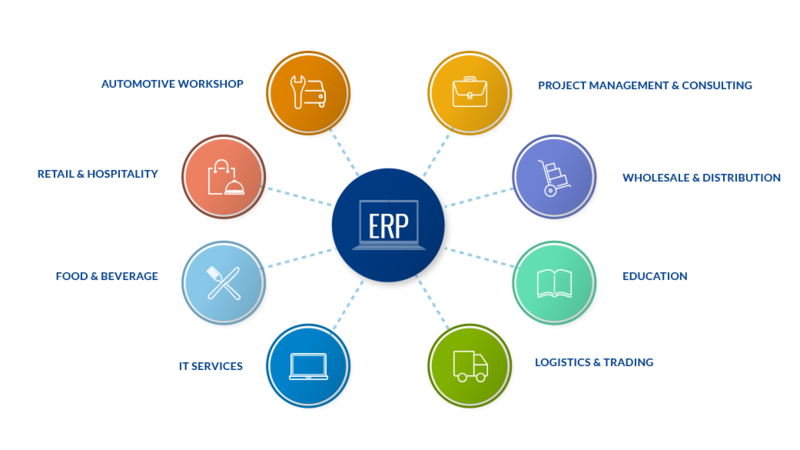 Our ERP systems are designed and implemented across a growing number of industries. Connect with customers, seamlessly manage your core business processes, and optimise and review your performance – Sidera ensures your investment is relevant and positions your business well to meet future challenges and goals. We can help you set up IT surveillance for the office, and adopt retail or F&B hardware solutions such as our restaurant paging system. Creating a secure and work-efficient workplace is easy with the help of our experienced IT consultants.